Is it possible to use DRAM with microcontroller AVR? Yes, it is possible. Jesperh has proved it. 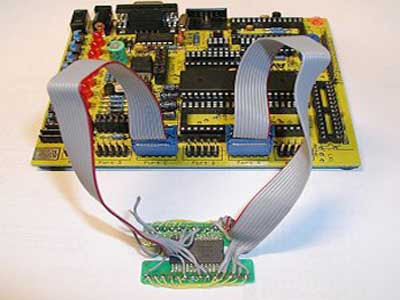 He hooked up a DRAM to a small processor (in this case an Microcontroller Atmel 8515), and handle the RAS/CAS sequencing and refresh in software. The type of DRAM is Hitatchi M5M44800, a 512k*8 DRAM!. Bigger than the original memory of microcontroller AT90S8515 that is 512 byte RAM. The project use C to programm it. The chip required small power consumption, only takes about 2-3 mA when just refreshing and with a low access rate. But, the consequency is it will be relatively slow and put some extra load on the CPU, but if you need a cheap, large RAM memory and can accept the overhead, this is the way to go. But, with more bigger memory you get. It would not to bad to try isn't. If you need source code, schematic, and documentatiaon about this microcontroller project click here (zip).